Learn how you can integrate granite into your home. When it comes to integrating natural stone into your home, you have a wide range of options to choose from. If you are in the midst of renovating your home, then granite is the perfect choice to enhance your property. Once you install granite into a specific room, it will enhance the look and feel of the entire space. Discover the many uses of granite when planning your next home improvement project. 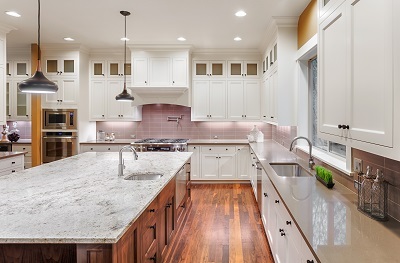 One of the most popular uses for granite is in the form of a kitchen countertop. Granite is widely seen in kitchen countertops because it is highly durable and aesthetically pleasing. The material is resistant to water and heat, so it is the perfect option for a busy kitchen. You will never have to worry about damaging your granite countertops while cooking. Granite countertops are also very simple to clean. Granite is a smart choice to install in your bathroom because it is resistant to water. So, it is a great material for a bathroom sink. You can install it as a basin or make an entire sink out of it. Granite sinks are incredibly long lasting and are very simple to maintain. Granite is a beautiful material, so your sink will be the focal point of your bathroom. When deciding on how to integrate granite into your home, you should look into flooring. Granite is a unique and aesthetically pleasing option for your home floors. Granite will add a pop of color to your home flooring. Granite is also popular in outdoor flooring as well such as backyard patios. ROCK TOPS FABRICATIONS USES THE LATEST TECHNOLOGY TO ENSURE THAT YOUR NEW BATHROOM SURFACES ARE DESIGNED, CUT, AND FINISHED EXACTLY HOW YOU WANT IT. WE HAVE OVER A DECADE OF EXPERIENCE AND HAVE BEEN CONSTANTLY IMPROVING OUR SERVICES AND OFFERINGS TO MEET THE DIVERSE NEEDS OF OUR CUSTOMERS. IF YOU ARE IN THE MARYLAND, D.C., OR VIRGINIA AREA AND LOOKING FOR A BEAUTIFUL NEW REMODELED BATHROOM, GIVE US A CALL AT 410-363-4257. FOR MORE INFORMATION AND TIPS ON MAKING YOUR HOME YOUR OWN, FOLLOW US ON SOCIAL MEDIA AT TWITTER, FACEBOOK, YOUTUBE, GOOGLE+, PINTEREST, AND HOUZZ.